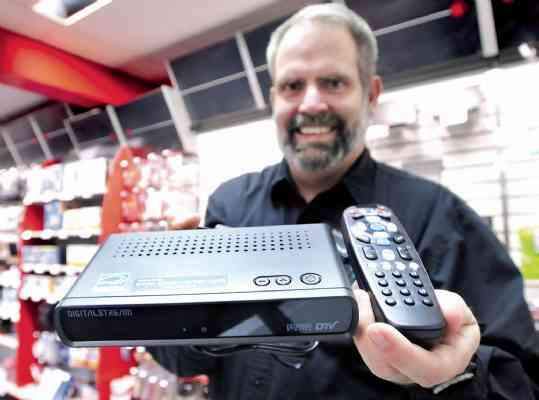 James LaPlant, a sales associate at Radio Shack in Durango, shows a digital converter. The boxes are available at several area stores. Most area residents appear prepared for the impending switch to digital television broadcasts, local sources say. Radio Shack has seen a drop in demand for the converter boxes needed to translate the digital signals into analog for older televisions. James LaPlant, a sales associate in the Main Avenue store, Monday said sales of the boxes have gone from a high of about 10 a day to two or three a day now. "I'm well-stocked on them now," he said. "July, August, September, we were running out because people were getting their coupons early." Other local stores offering the boxes include Rite Aid, Sears, Wal-Mart and Office Depot, according to www.dtv2009.gov, a government Web site with information on the switch. The Durango area will be less affected by the switch than some areas because many of the stations here are broadcast by translators, which currently are not required to change to digital. Translators often are employed in communities that are mountainous or too far away from a full-power station, according to the Web page for the National Telecommunications and Information Administration. Low-power stations also are exempt. In the Durango area, this includes channels 25, 29, 39, 45 and 31, according to the Web site. The government set aside $1.34 billion to help cover the cost of the boxes for people whose televisions aren't digital capable. Those who requested their coupons early are likely feeling fortunate after news surfaced Monday that the government has run out of money for the program. Those requesting them now are put on a waiting list until more money becomes available. Cable subscribers and residents with satellite television will not be affected. Nor will people who have digital televisions. Some people are bypassing the boxes and buying new televisions or subscribing to cable or satellite television. Ryan Means, a sales associate at Louisa's Movie House and Electronics, said many people buying new televisions, which are exclusively digital, cite the transition as a reason. "We hear it a lot," he said. Sean Hogue, regional vice president for Bresnan Communications, said cable sales are up. He said it is hard to tell exactly how much of that could be attributed to the digital changeover. "I do think we're maybe getting some lift" from the transition, he said.